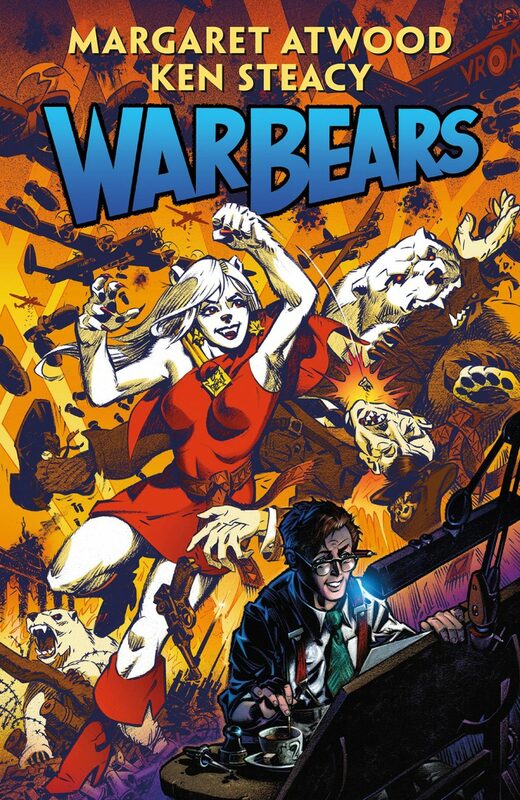 I didn’t quite know what to expect from Dark Horse Comics’ War Bears. I checked out the last book from Margaret Atwood, Angel Catbird, and figured this had to be somehow connected to it. Instead, we get a story embroiled in Toronto, 1943 of a young comic book artist trying to make a name for himself. From Atwood and Ken Steacy with art by Steacy, the book pays homage to the old black and white Canadian comics that came to be during World War II. Our “hero” is Alain Zurakowski, an aspiring comic book artist looking for a shot. He gets his foot in the door at Canoodle Comics, working for Editor Gloria Topper. The vibe of the book is very fitting of the era it takes place in: the company has a gritty, fast-paced newsroom feel to it, one that Alain must learn to either sink or swim in. When he creates Oursonette, a were-bear female fighting the Nazis alongside her helper bears, Alain thinks he is finally going to break through. But life isn’t that easy, or fair, as he finds out. We get two different stories here: one being Alain’s journey to drawing his own book, and the other story being the book he created, following Oursonette and her fight against evil. Alain’s story is told in a very complementing style, one that harkens back to the early days of comics. The tale of Oursonette is told in stark black and white, full of energy and history. Atwood and Steacy have created an awesome start to this brand new book. I love the idea of the story being about an up and coming comic book artist, and seeing the hardships he faces along the way. I didn’t expect the story I got from War Bears, but I am glad I got it. Jump on board, this story is going places. Nolan P. Smith is the Editor and Co-Founder of Pastrami Nation. Being a reporter for the past 10 years, he has worked for a variety of media outlets, from newsprint to the ever-evolving internet platform. Residing in Victorville, CA, writing has always been a major aspect of his life. You can usually find him at comic book conventions, looking for more amazing books to dive into. You can follow him on Twitter @nolanpsmith and on Instagram @kakooee. Next Transformers: Unicron #4 Review, The Gang’s All Here!